This is a sponsored post for Cayman Jack but all opinions and content are my own. As you've probably figured out, I love my margaritas - simply put, the touch of sweetness from agave nectar and the citrus bite of is one of the most refreshing flavors you can find. Unfortunately, you can't always take margaritas with you since traditionally it involves tequila and that means it isn't available in all the same places as your favorite beer. With Cayman Jack though, since it is a "malt beverage" it's available nationwide in select grocery, convenience, and liquor stores in areas where hard alcohol is prohibited. In San Diego, outside of the classic fish taco, my favorite culinary concoction is the famous "TJ Dog" that is inspired by our sister city of Tijuana. 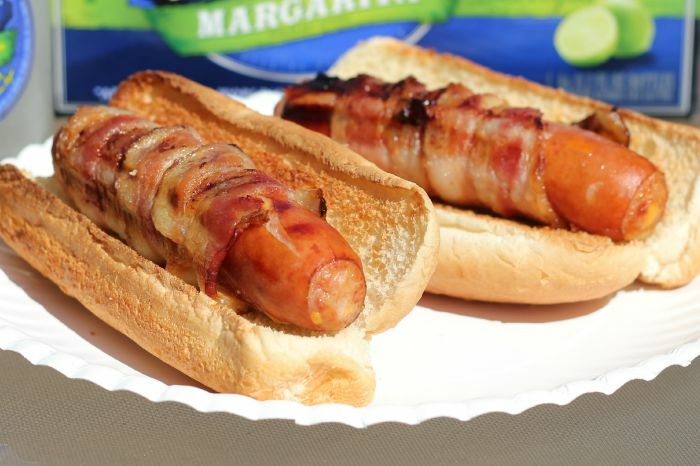 Traditionally it is a bacon-wrapped hot dog served on a toasted bun covered with grilled onions and peppers. 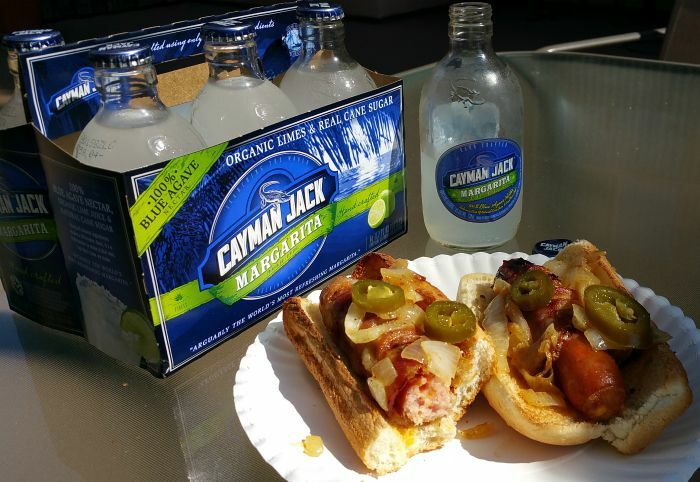 For today, I'm taking it a step further by swapping the simple hot dog for a cheddar brat and I'm going to enjoy an ice cold Cayman Jack while we do it! Chop the onions and saute or grill them in a flat pan until they are golden brown. Add butter, garlic salt, and mustard powder as needed and keep stirring to avoid burning. Take a piece of uncooked bacon and wrap it around the brat. The ends may be uncovered but that's ok.
Place the brat on the grill and make sure to cook all sides completely. Once the bacon is thoroughly cooked and you've toasted your bun, place the dog in the bun and top with grilled onions and jalapeno peppers. Your dog is now ready to eat! I find that the mixture of savory, greasy, and spicy flavors from the TJ dog goes perfectly with a good margarita. Cayman Jack is no exception to this rule. Even better is that with an alcohol level of only 5.8, you can drink a few of them comfortably without feeling like you're ready to pass out. For those of you who aren't mixologists, that puts it right between a typical beer that has between 4.5-7% and 15-25% for a traditional margarita (depending on who's pouring!). There's another malt beverage margarita out there and frankly when I first heard about Cayman Jack I thought it was a clone of that 'rita. However, I really didn't care for it since it didn't taste like a true margarita. However, from my first sip I was super impressed to discover that Cayman Jack has focused on premium ingredients including 100% Blue Agave Nectar from Jalisco, Mexico, Organic Key Limes from Colima, Mexico, and Pure Cane Sugar from Brazil instead of cheating and using high fructose corn syrup. That isn't to say that this is a diet drink or that it is "good for you" but if you are going to enjoy a tasty alcoholic beverage with friends I find it import to go for as high quality as possible. Like any margarita, Cayman Jack can be enjoyed with key limes, coarse salt for the rim and poured over ice in a rocks glass. However, for convenience I think it tastes great out of an ice cold bottle that's been chilling in your ice chest too. Cayman Jack retails for $8.99 for a 6-pack of 11.2 ounce bottles or 12-pack of 8 ounce cans (remember - no glass bottles on the pool deck!). 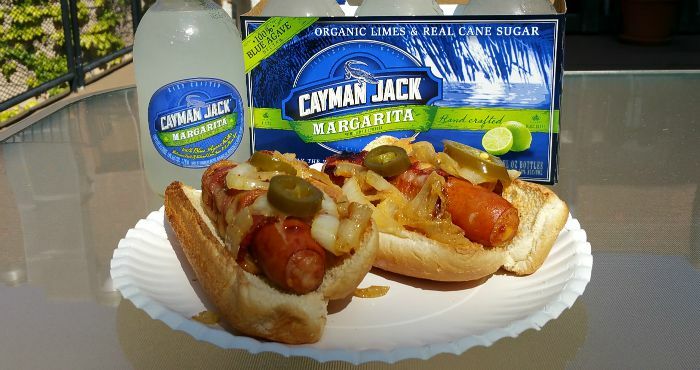 Follow @CaymanJack on Twitter, Instagram, and Facebook or visit their website to learn more. This is a sponsored conversation written by me on behalf of Cayman Jack. The opinions and text are all mine. Guys Night Out Idea - More than "Popcorn and a Movie Night"